What is it about mason jars? Did you ever wonder why people love them so much? Is it that they remind you of a gentler time, when people actually bothered with canning and took time with the little things that make home more special? That’s definitely part of it for me. But I also love the broad variety of colors they come in, both old and new, and what these colors add to a table setting. 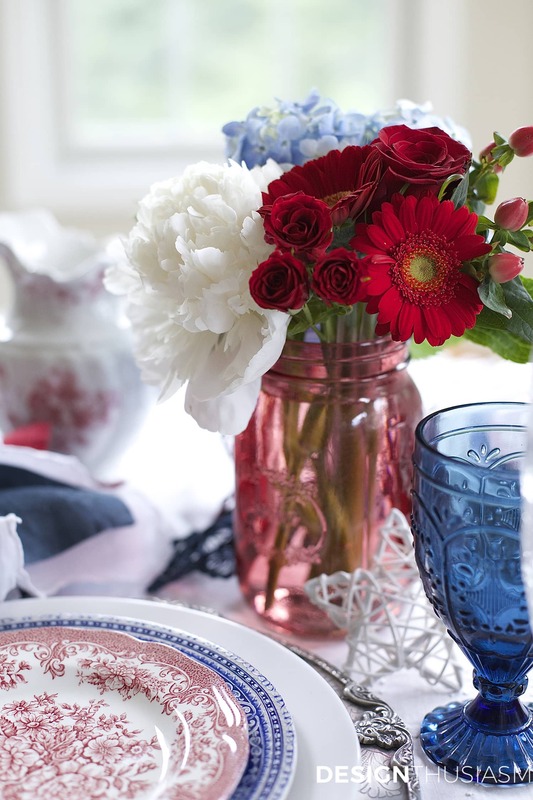 For the tablescape above, done for a Fourth of July brunch party, the cherry mason jar adds just the right note of color to bring out the reds scattered about the table. The lovely floral in red, white and blue becomes all the more vibrant in the colorful little jar. In paler colors, the sweet emblems on the sides are more visible and enhance their charm. 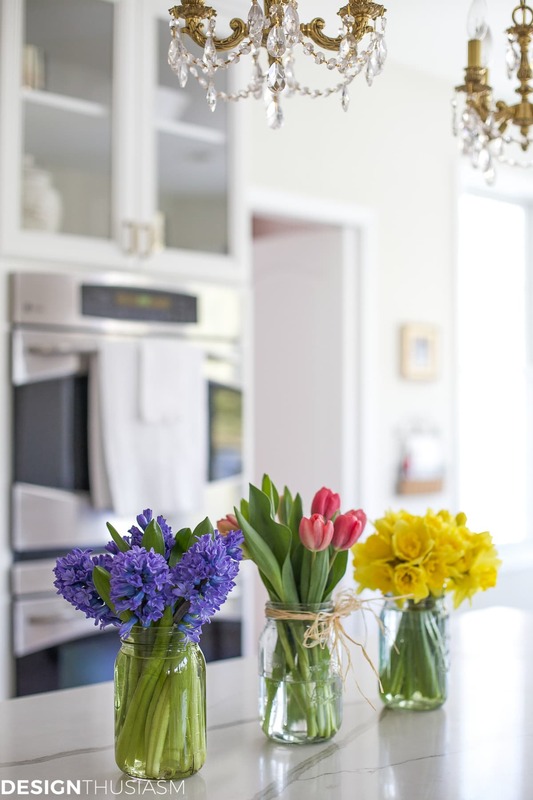 In this kitchen styled for spring, I used a trio of mason jars, each one filled with different spring bulb flowers. I mixed pale green jars with clear ones to highlight the greenery in the flowers. 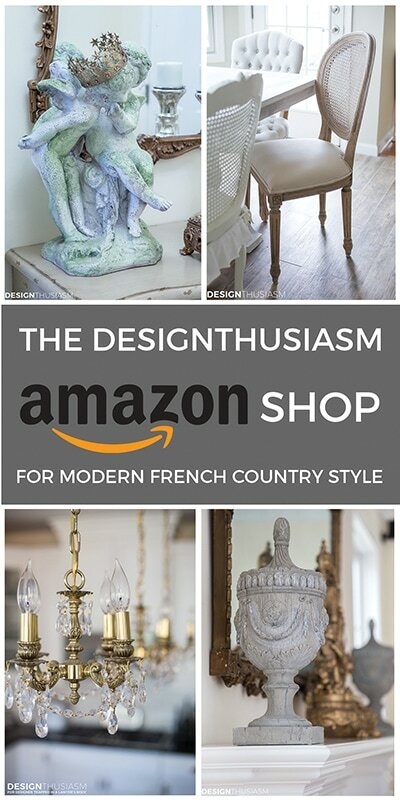 The final touch is the raffia tie on the center jar, making the grouping look more playful, while providing a lovely farmhouse finishing touch. The photo below is probably the most popular photo I’ve ever posted. While I do enjoy bright colored jars, I really get excited for these vintage jars, with their aged imperfections and soft hues. The pale blue is so pretty, and because they’re so old, no two jars are exactly the same color and all of the logos are a bit varied, as well. 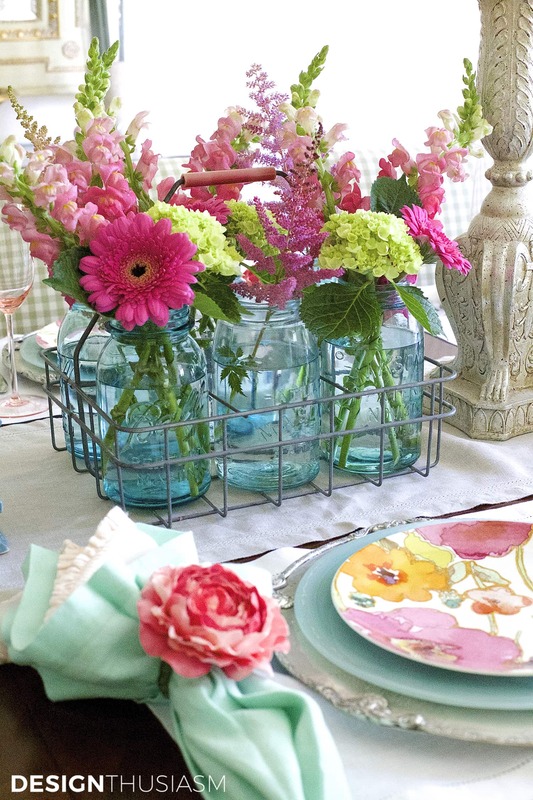 They’re especially fun placed in the vintage milk bottle carrier, and the summer flowers chosen bring out the tones in the plates in this colorful tablescape. As charming as vintage mason jars are, I can also appreciate new canning jars in rich colors. The deep purple below was the perfect option for these pink and purple florals for an anniversary party. While I transported them in the caddy, they wound up sitting each one alone on a hightop cocktail table, and their diminutive size was balanced by the vibrance of their color. 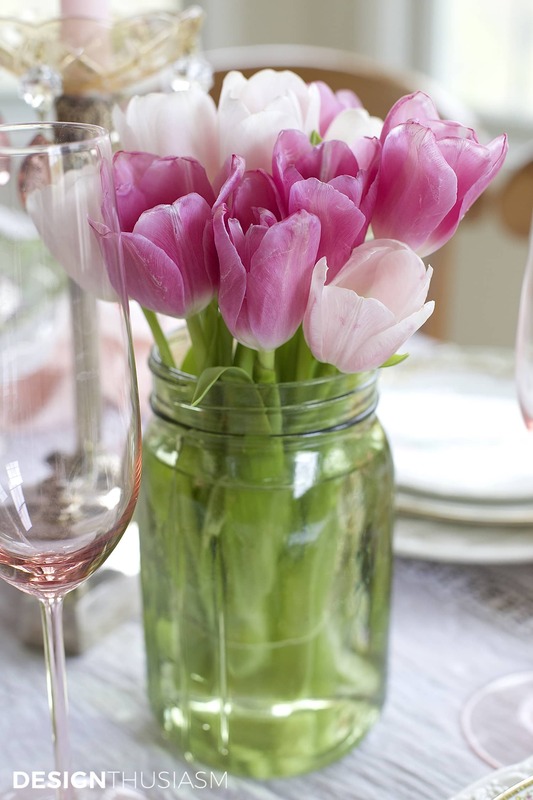 Sometimes it’s not just the jar and the floral but the way they’re placed that makes the presentation special. 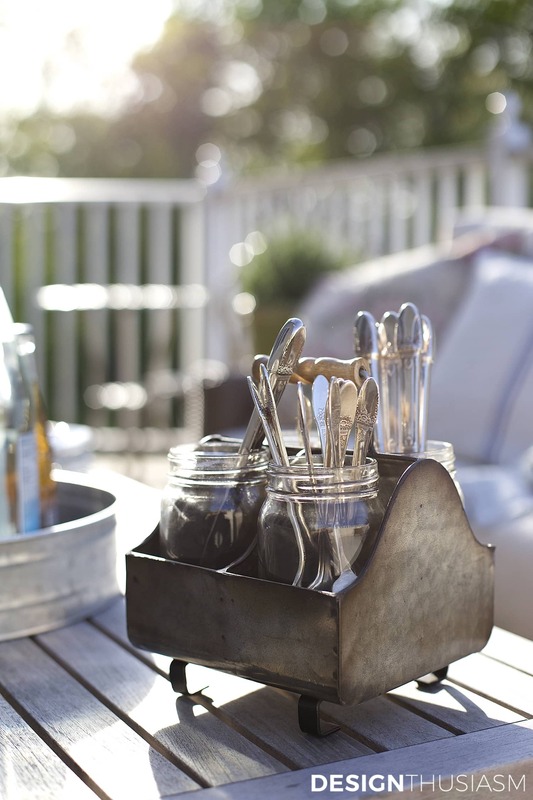 On this summer table, set for a clambake, the varied heights of the jars, which are lifted by inverted glasses, adds a sense of movement to the table’s centerpieces. This works particularly well with the vintage jars, which already have some variation built in. What’s great about mason jar centerpieces is that they’re small in size, so they’re perfect to add to a table that has other things going on. 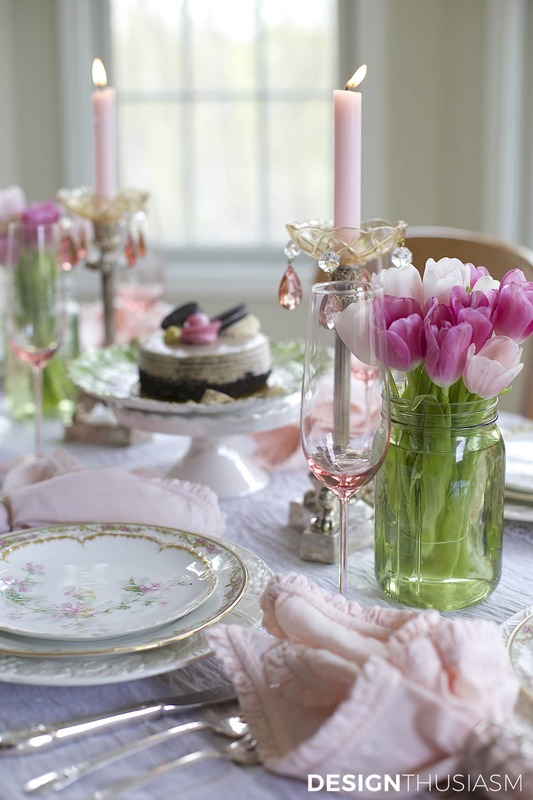 The spring table below mixes new and vintage style and the cake plate and candlesticks are already center stage. 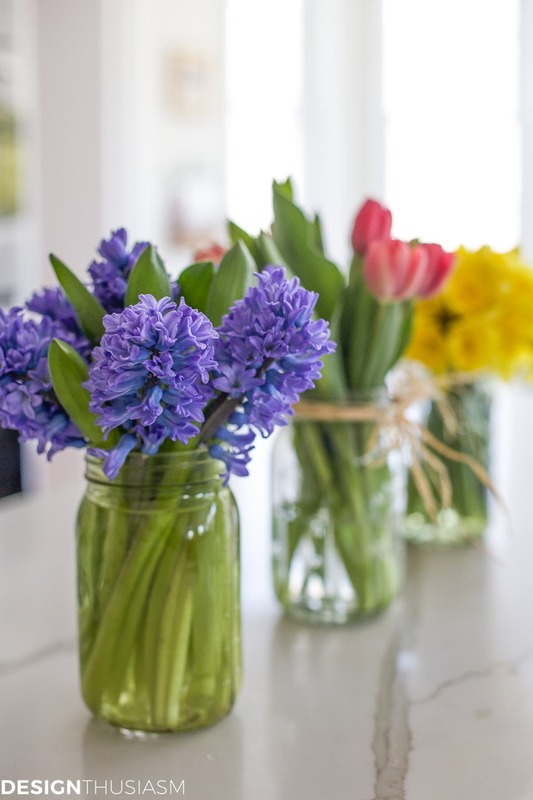 Including mason jar florals is an easy way to add fresh flowers, as they can be tucked into small spaces without crowding the table. The jar is actually green, although that’s not easy to tell, but the color emphasizes the spring green stems in this lovely tulip bouquet. 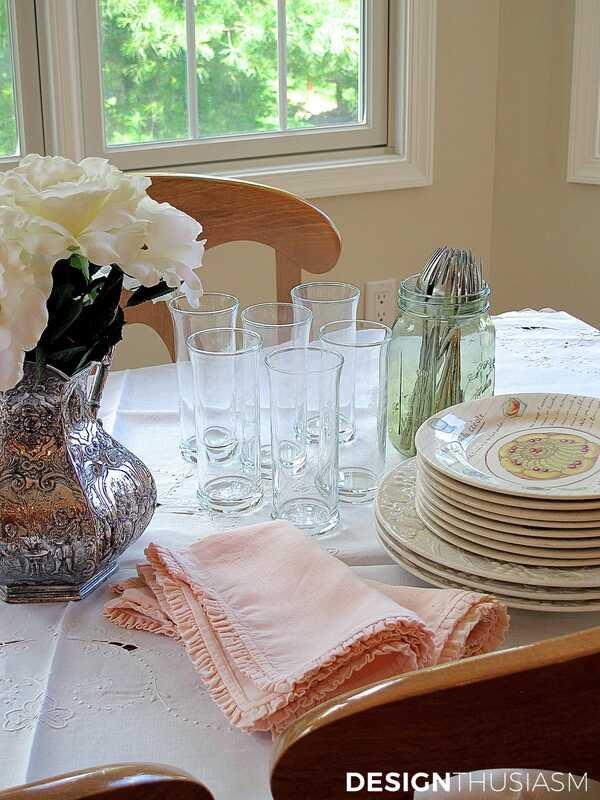 Once again, below, in this simple breakfast buffet setting for weekend guests, the mason jar serves as a holder for the forks. When placed against white, you can really appreciate the color, despite the fact that it’s soft and pastel. 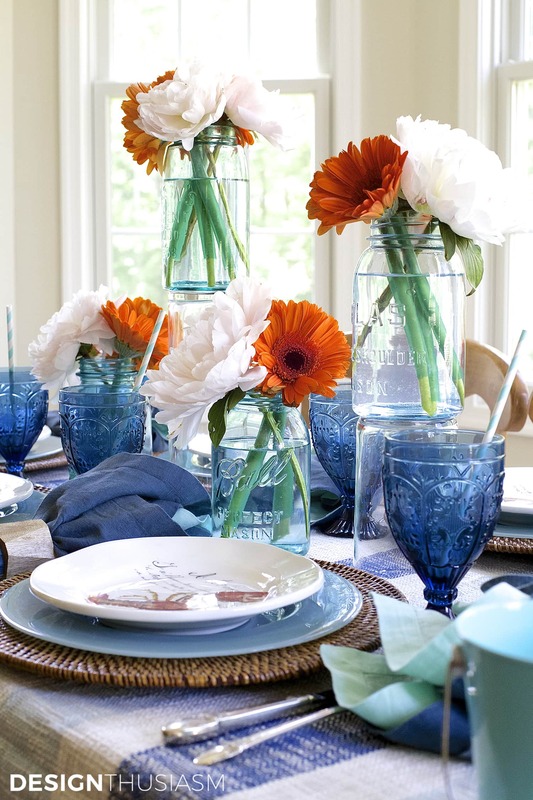 I have so many different vessels that I use for florals, but few are as enchanting as mason jar centerpieces. 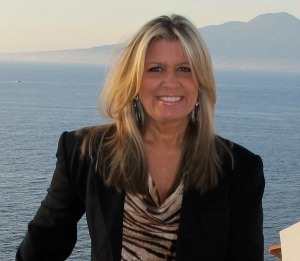 In fact, I’m working on a new tablescape just today that I’ll be sharing with you very soon. You can be sure to be on the lookout for these delightful little florals and just maybe they’ll remind you of days gone by. 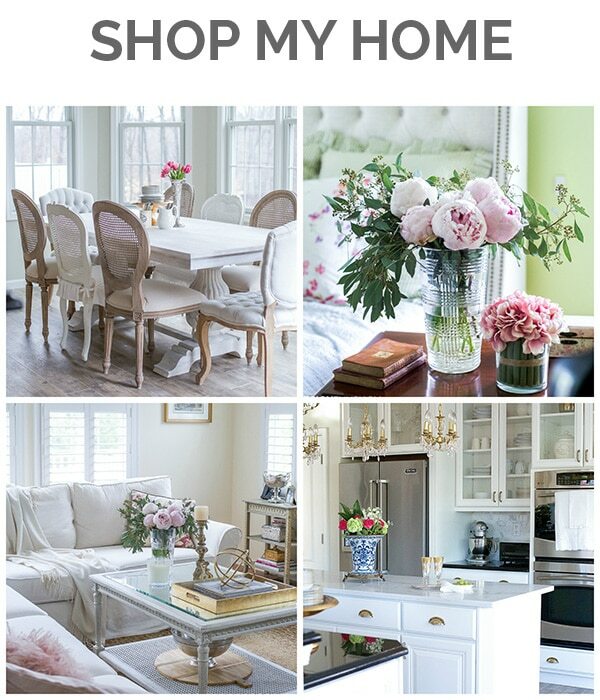 « Home Style Saturdays 29 | Are You Into Spring Cleaning? Mason jars have come a long way. I remember as a child visiting my grandparent’s farm, they had a long table ( like the ones so popular now). There were three mason jars that stayed one the table/ one for spoons, one forks, one knives. I do remember a color kinda between green and blue. I think your displays with the pink flowers has to be my favorite. It makes the green leaves pop. I think Easter decorating is my favorite next to Christmas and Thanksgiving. But yours are beautiful for any occasion 🙂 !! 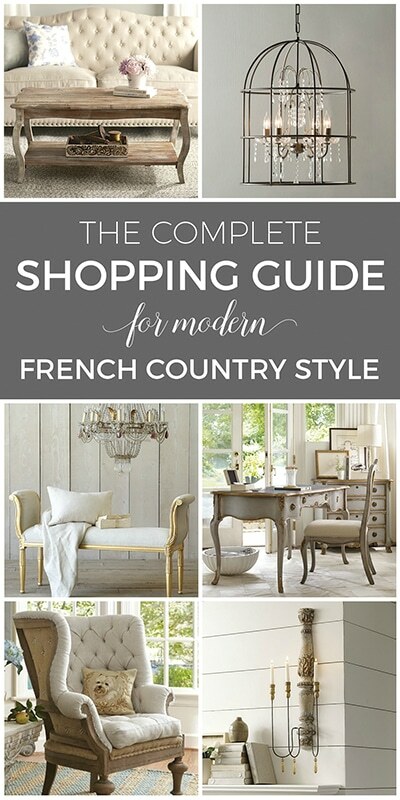 Great vignettes Lory! Missed seeing your Mason jar Seder plate, though. So very creative you are! Right on time for the Spring and Summer months! Beautiful! Lovely post and especially enjoyed the mason jars. I have been a fan of them forever – especially the blue ones. Love garden flowers in them. Yes, mason jars remind me of the days when I make jam. Today, I made orange marmalade, using oranges from our tree. Next month, when my boysenberries ripen, I’ll be making boysenberry jam. This summer, I’ll be making peach jam. I always make plenty, so that I can include jams in Christmas gifts. So, my mason jars have a designated purpose and I don’t use them for anything else. Yours look nice with the flowers, especially those thaat are packed full of flowers! 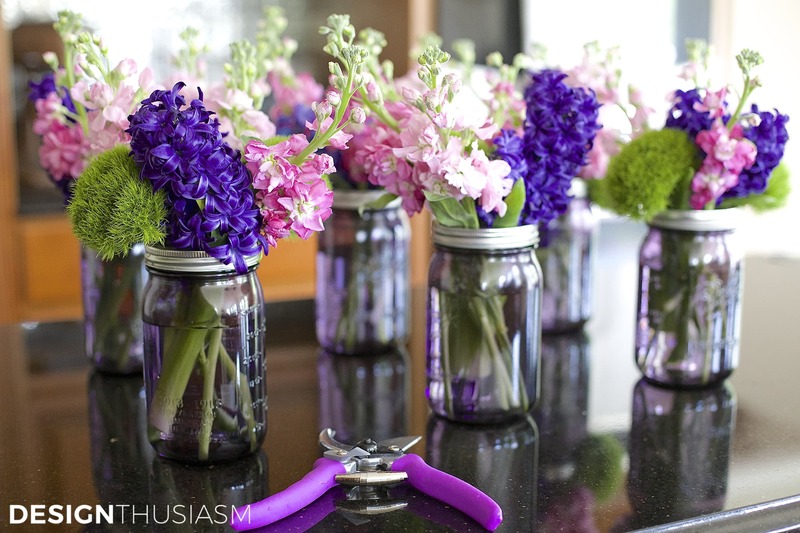 I have a long standing love affair with Mason jars…just the right size for floral arrangements and yours are lovely. They are so fun to play with, so versatile and inexpensive to purchase! 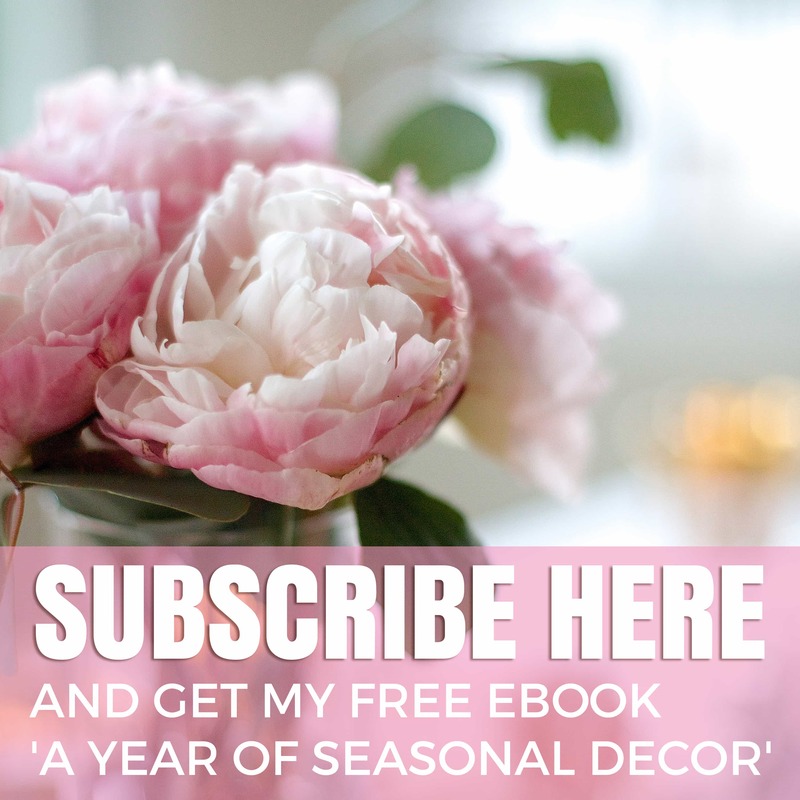 Love all of these photos – the flowers are so pretty, bright and cheery! I have a few blue jars I used for asst’d beans and rice mix. I see how lovely your flowers look in them so I’ll use them for that as well. Thank you for your creativity. 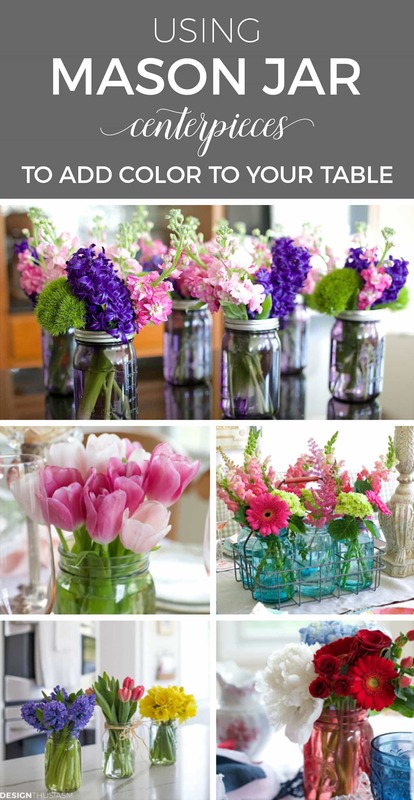 Great ideas for the use of the jars, beautiful flowers in the pictures. These are some great ideas. On the breakfast buffet though, the forks should be facing down as they are on th3 outdoor patio display so the eating portion of the fork isn’t touch by everyone.